Tough and rugged, the Mitsubishi Shogun Sport is a truly capable tool. If you're in the market for that kind of thing, it's a stand-out choice. Missing from UK sales rooms for the past decade, the Shogun Sport has returned with a vengeance. Sharing the fundamentals of its construction with the ultimate working-man’s pick-up, the Mitsubishi L200, strength and durability are the name of the game with the revived SUV. Just two trims are available and both offer the same 2.4-litre turbodiesel four-cylinder engine producing 179bhp via the eight-speed automatic transmission. Its monster towing capacity of 3.1 tonnes [...] just beats the hauling power of the infallible Toyota Land Cruiser. 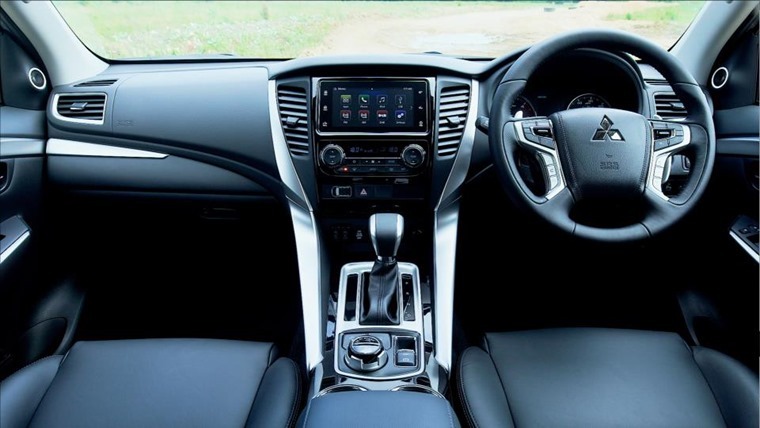 The Shogun Sport 3 comes with 18in alloy wheels, LED lights, dual-zone climate control, a reversing camera, privacy glass, and a touchscreen infotainment system with a DAB radio, Bluetooth connectivity, Apple CarPlay and Android Auto. 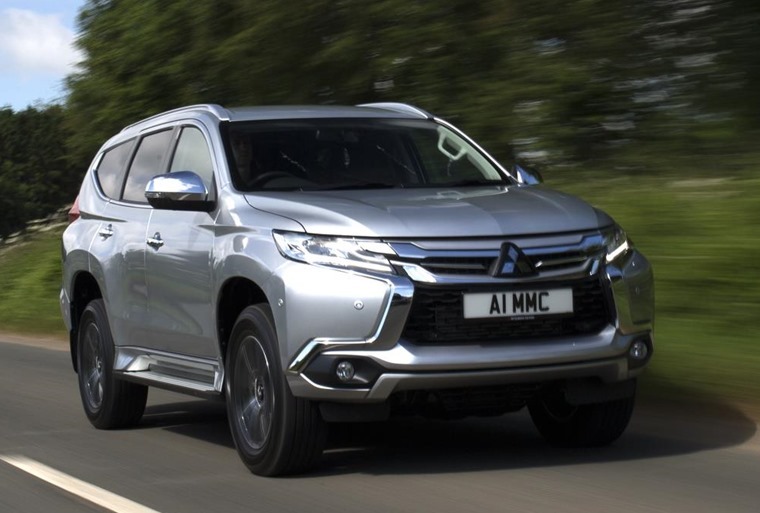 The top-spec Shogun Sport 4 we’re testing also boasts heated front seats and adaptive cruise control and is expected to account for the large majority of sales. On top of that, Mitsubishi also estimates nearly 90% of vehicles will be specified with a tow bar due in part to its monster towing capacity of 3.1 tonnes. To put that number into perspective, it just beats the hauling power of the Toyota Land Cruiser. But this only scratches the surface of the Shogun Sport’s capabilities. There’s 218mm of ground clearance, an approach angle of 30 degrees and departure of 24 degrees, and a wading depth of up to 700mm. This all combines to bolster the Shogun Sport as the ultimate SUV and goes to prove how SUVs in 2018 have perhaps erred too much toward being predominantly road-based in design and capability. This is all made possible by the rotary controlled Super Select four-wheel drive system which can send all of the power to the rear wheels only or to engage full-time four-wheel drive. On top of that is the new Terrain Control System. This offers four off-road driving modes: gravel, mud/snow, sand and rock which modify traction control, throttle response and gearshift points to get the best possible grip for pulling away. 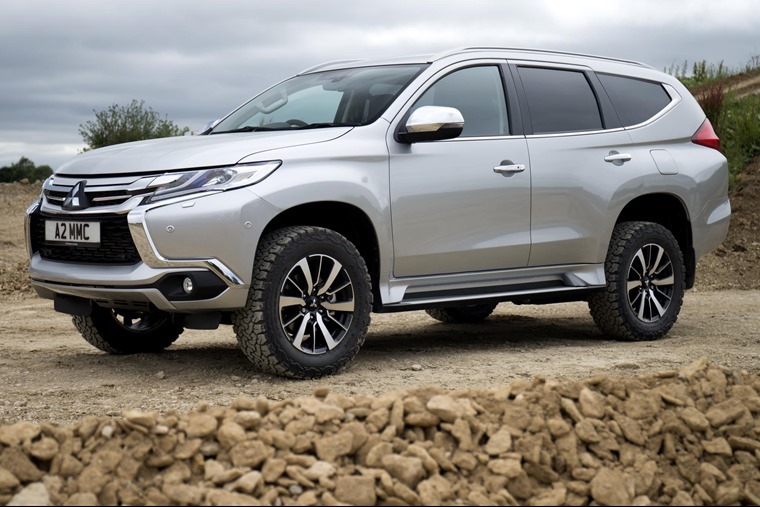 All pretty impressive stuff I think you’ll agree, easily backing up Mitsubishi’s aim of offering the world an authentic off-roader first and foremost. It is perhaps no surprise that where the Shogun Sport suffers then is on the road. Acceleration proves sluggish from the off, with the 2.4-litre turbo diesel sounding at pains to get the Shogun Sport up to speed. There’s quite a lot of road noise on the motorway and imperfect road surfaces prove to be a problem for the overall comfort of the SUV, a shame when the majority of those looking to get one will presumably be in the countryside. The interior is certainly comparable with most modern pick-up trucks, albeit with a bit more luxury. The eight-speed automatic works through the gears perhaps a little too quickly but this has the trade-off of helping improve fuel economy. Throughout a week of commuting and mild off-roading, MPG was never below 30 and reached a high of 40 which is pretty impressive for a car weighing over 2100kg. 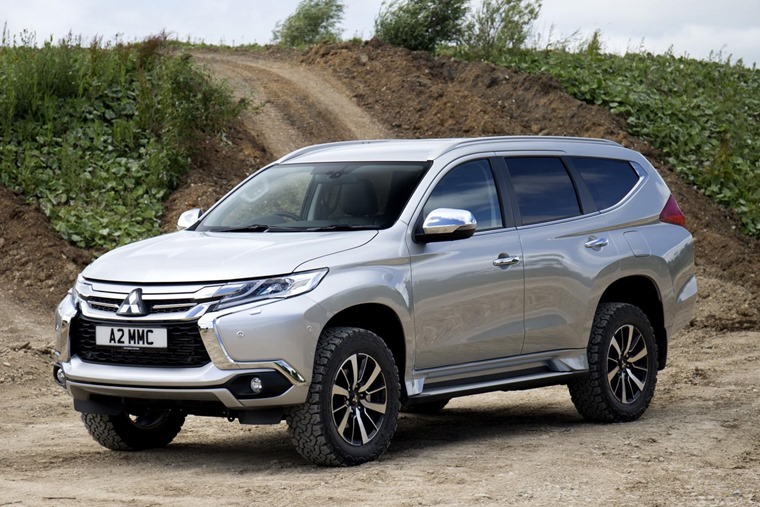 Add to that it is a capable and comfortable cruiser, with bespoke body mounts, comfort-orientated dampers and increased cabin insulation all added onto the body-on-frame L200 underpinnings for additional refinement, as well as rear suspension to enhance ride and handling. The interior is certainly comparable with most modern pick-up trucks, albeit with a bit more luxury. Pillar-mounted handles and side-steps help you into the elevated cab with ease, and as is to be expected the high driving position offers good visibility all around. The front seats are heated and also electrically adjustable and the steering column offers scope adjustment meaning it’s easy to get very comfortable very quick. The layout in the cabin is functional and easy to use. There’s no shiny bells and whistles, no Alexa-lite voice commands, just a 7.0in touchscreen infotainment which can be paired to Apple CarPlay or Android Auto. It’s basic but feels right for the vehicle and didn’t leave me scratching my head wondering where a specific feature was or getting lost in endless sub-menus. Mitsubishi has made a pick-up derived vehicle that is fit for purpose [...] on top of being rugged and capable enough to survive the worst zombie apocalypse in any terrain. Head to the rear of the SUV and things aren’t quite as good. A seven-seater on paper, getting the sixth and seventh seats up or down requires a Crystal Maze-esque level of pushing and pulling toggles and levers in the correct sequence to get the desired result. Compare this to the Land Cruiser which only required the simple push of a button and the Shogun Sport suddenly seems a bit retro. The good news is that, unlike some, these extras seats are actually suitable for adults on short trips. With all seven seats up boot space is a narrow 131-litres. In five-seat configuration that jumps to 502-litres but still pales in comparison to its main rivals. 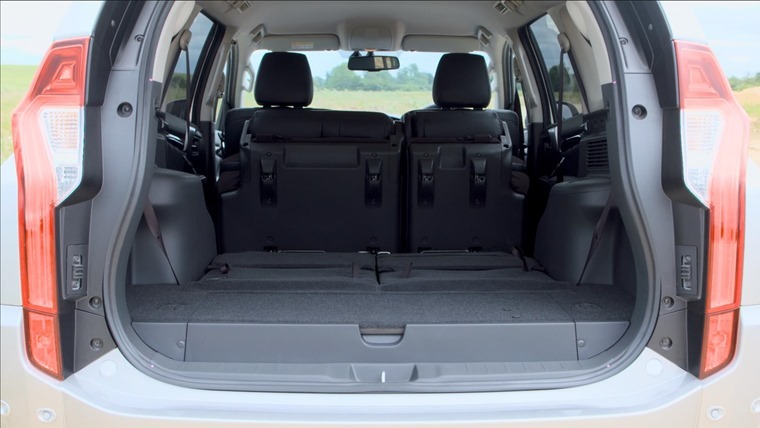 With everything folded down there’s nearly 1,500-litres of space at your disposal. But alas the rear seats don’t fold flat and wheel arches take up some of the space. All of this seems at odds with the sheers size of the Shogun Sport. At 4,785mm long, 1,815mm wide and 1,805mm high, it is a bold and divisive design which brings to mind an Eclipse Cross on steroids, particularly at the rear. Despite those numbers it’s a surprisingly manoeuvrable SUV, with a great turning circle. Add to that reversing sensors, a 360 degree camera and a blind spot warning system and it’s the kind of big truck anyone can drive with confidence. In summary, Mitsubishi has made a pick-up derived vehicle that’s fit for purpose and offers enough mod-cons to keep anyone in comfort. It boasts class-leading towing capabilities and is rugged and capable enough to survive a zombie apocalypse. If that’s what you’re after, then you should consider it. With a design reminiscent of the smaller Eclipse Cross, the Shogun Sport has the type of rugged and capable look that lets you know this pick-up derived 4x4 means business and can back it up. The layout in the cabin is functional and easy to use, with no bells and whistles it might be more basic than you’d expect for 2018 but it works well. Everything is luxurious but hard-wearing. 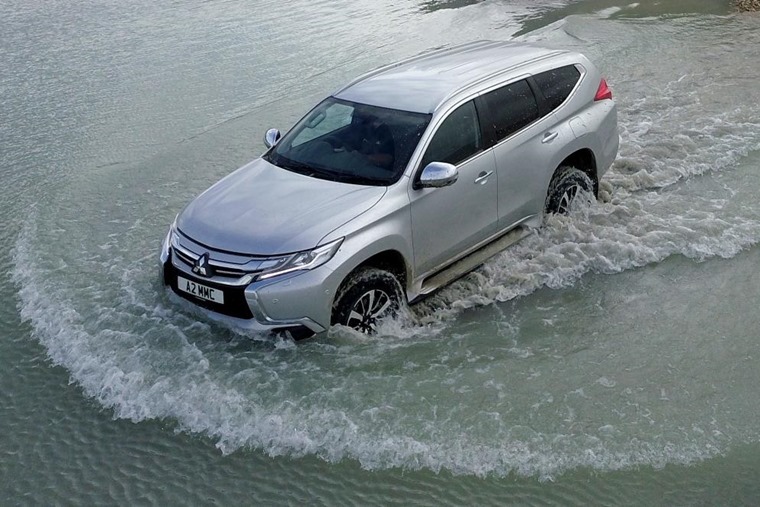 With 218mm of ground clearance, an approach angle of 30 degrees and departure of 24 degrees, and a wading depth of up to 700mm, the Shogun Sport has a valid claim to being the ultimate SUV. On road lets it down somewhat with sluggish acceleration and road noise. At 4785mm long, 1815mm wide and 1805mm high, there’s plenty of space for seven adults on a short journey. When it comes to luggage space, it isn’t the best in the segment and even with all seats down can’t compare. Official MPG figures of 32.8 were correct with us. Figures never got below 30 and reached a high of 40 which impressed us for the sheer size and weight of the vehicle.